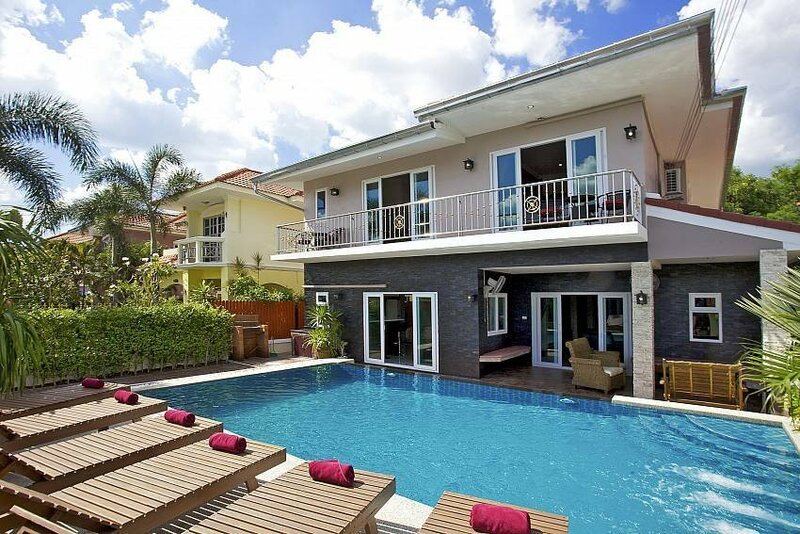 Baan Calypso is a gorgeous, 7-bedroom private pool villa in a quiet, secure Jomtien estate. Designed and newly refurbished by experts in creating perfect vacation homes, the villa’s attention to detail will surprise and delight you. The outdoor area features a large, 38 sqm swimming pool with Jacuzzi jets and wide, circular stairs leading into the refreshing water. In the evening, custom lighting sets a romantic, tropical mood, and can even change the pool’s color. Two outdoor seating areas include a sunny line up of loungers and a covered terrace with bespoke seating and high-powered fans. There is also a built-in barbecue, outdoor shower, and private parking. Inside, the open plan lounge is just as inviting. The living area is large and well-planned, and at its heart is a lounge with massive sofas massive LCD satellite TV with surround sound, so you never have to miss a game (no matter who your team is). In the corner, there’s a library area with desks and LAN internet, in addition to the Wi-Fi throughout the villa. There is a formal dining area that seats 14 with granite-topped table and chandelier, as well as a fully equipped custom kitchen. The villa’s 7 bedrooms all have king-sized beds, special color schemes, green views, and ensuite bathrooms. The three ground-level bedrooms are all wheelchair accessible. Jomtien is perfect for families and for large groups that seek a slightly slower pace than go-go Pattaya. The fully secure estate where Baan Calypso sits is only 1000 meters from Jomtien Beach and an easy walk to many Thai and International restaurants and shopping markets. The location is perfect for accessing local attraction because it’s only 250 meters from Pattaya’s main road, Sukhumvit, where you will find Pattaya Floating Market, Underwater World, and some great shopping. Central Pattaya is a 10-15 minute drive, and Sukhumvit has great transport option for those who prefer not to drive. The seven bedrooms all have custom color decor created by Chiang Mai craftsmen, king-sized beds, cable TVs, ensuite bathrooms and green views. The master family suite sits on the upper level and additionally has a sofa bed that sleeps 2 children. The balcony, with pool and garden views and a small seating area, is shared by another bedroom. The other two upper level bedrooms have jungle views. The three bedrooms on the ground level are wheelchair accessible with wall garden views. The seven bathrooms each have dual showers (rain and handheld) with glass partitions, hot water in all taps, and toilets and sinks. On the ground level, one of the ensuite bathrooms has dual access to the lounge providing a “guest toilet.” Additionally, there is a shower outdoors by the pool. The fully equipped compact kitchen is part of the open plan living area, and boasts teak wood cabinetry and black marble worktops. The oversized fridge/freezer is large enough to hold everything for your party and other appliances include a hob, extractor fan, oven, toaster, and kettle. The breakfast bar is white marble and provides additional, casual seating. Outside the built-in BBQ is serviced by granite countertops, making impromptu dinners a delight. The living room takes center place, and is sure to become the heart of your gatherings. From here, you’ll have views of the side garden and Lanna-Thai Ramakien bas-relief that inspired this villa. Three large black leather sofas are arranged perfectly of conversation or to enjoy the enormous 58” LCD satellite TV. You can turn up the sound and enjoy yourself, knowing that the bedrooms have special doors to block out unwanted noise. There is also a dedicated study corner with desk space and LAN internet for when you need a little more oomph for your web surfing than the Wi-Fi can provide. The dining area might be the most magnificent place in the house, with customizable crystal LED chandelier and magnificent wooden wall sculpture. The grey and salmon-streaked marble table seats 14, and the chairs have been custom-built to fit perfectly with the elegant mood.